The state-of-the-art Don Myers Technology and Innovation Building is open for business. It’s a 70,000-square-foot complex of high-tech laboratories, classrooms, and shared research space, and it offers students and faculty new opportunities for collaborative research. The building contains College of Arts and Sciences departments, such as computer science, physics, and mathematics and statistics. 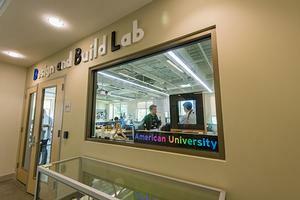 It also has the AU Game Lab, the AU Center for Innovation, and the AU Entrepreneurship Incubator, as well as the Design and Build Lab (DaBL), colloquially known as the makerspace. “Twenty-first-century research requires twenty-first-century facilities. The Don Myers building will build on the already vibrant synergy in the sciences here at AU and foster strong collaboration across the physical and mathematical sciences,” says College of Arts and Sciences dean Peter Starr. The Don Myers building reflects AU’s substantial commitment to STEM—science, technology, engineering, and math subjects that are critical to a twenty-first-century economy. Yet multidisciplinary efforts also include the arts as part of the nascent STEAM movement (the “A” for “arts,” and the “E” here for “entrepreneurship”). Kathryn Walters-Conte is the coordinator for science outreach and the organizer of AU’s first STEAM Faire. In supporting STEAM, she wants spaces like DaBL and the incubator to be used university-wide. “Having the ‘A’ in there is not only for arts, but also for accessibility. This is not just something exclusively for students who are studying science: These spaces and these resources are for everybody,” she says. DaBL highlights that strong nexus between science and the arts. This makerspace is part of a nationwide effort to get people working with their hands again, and it includes everything from a laser cutter to a sewing machine. DaBL manager Kristof Aldenderfer, CAS/BS ’07, describes a place where things are designed and the designer is involved in the entire development process. Jonathan Newport, who teaches physics and is heavily involved with DaBL, has personally designed complex gadgets to enhance scientific knowledge. For instance, he constructed a device that allows people to “hear” electronic noises, as it picks up signals from cell phones and amplifies the signals to make sounds. He also spends hours ensuring that these devices are visually appealing.